Equal parts heartbreaking, funny, and life-affirming, this is a story about love after the most profound loss, for fans of Jesse Andrews, Rainbow Rowell, and Jennifer Niven. Seventeen-year-old Tess Fowler has dropped out of high school, tossed her laptop in a freezing lake, then jumped in after it fully clothed. Why? Because Jonah was the boy she knew only through texts and emails but understood to his very core. Jonah was the only boy she’d told she loved and the only boy to say it back. And Jonah was the boy whose suicide she never saw coming. Jonah’s death has sent Tess pinwheeling into grief and confusion. But even though he’s gone, Tess still writes to him. She wants answers to the yawning chasm of questions that’s become her life. At the same time, she’s trying to find solace in her father’s alternative funeral business. Who knew that arranging last rites for prized pets could be so life-affirming? But love, loss, and life are so much more complicated than Tess ever thought . . . especially after she receives a message that turns her already inside-out world totally upside down. 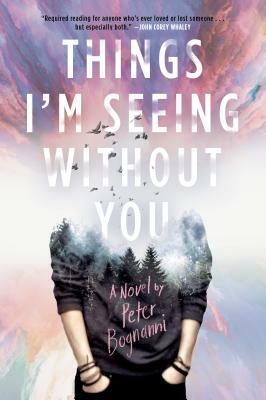 As funny as it is heartbreaking and completely unputdownable, Things I’m Seeing Without You shows us what it means to love someone, to lose someone, to wade through the beautiful/strange agony of the aftermath, and somehow love again. Peter Bognanni is a graduate of the Iowa Writers’ Workshop. His debut novel, The House of Tomorrow, won the LA Times award for first fiction and the ALA Alex Award and has been adapted into a feature film. He teaches creative writing at Macalester College in Saint Paul, Minnesota. "Required reading for anyone who’s ever loved or lost someone...but especially both."